Central Illinois Elite was formed in 2017. It is a partnership between Midstate SC, Illinois Fire Juniors, FC Peoria, Illinois FC, & SASA. 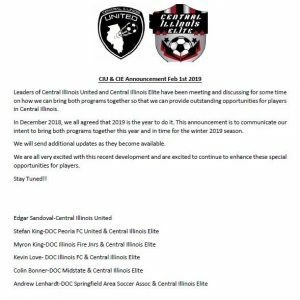 Central Illinois Elite will enter teams this summer 2019 into the Super Y League. In 2017 we had approx 300 players, playing on 14 teams. All players regardless of their club affiliation during the regular season are invited to tryout for one of our Super Y teams. CLICK HERE FOR DETAILS ON FEB 2019 TRYOUTS!